Posted on May 13, 2008 by D.C.
Andy Vandervell over at Trusted Reviews has posted a new review of the 11.1-inch Asus U2E online. The model reviewed is the Asus U2E-1P057E which comes with a 32GB Solid State Drive (SSD). In addition to the 32GB SSD, it comes with 4GB of memory and two, count them two, batteries (3-cell and 6-cell). This is a rather unique ultraportable – it comes with a leather covering in areas. The U2E faired very well, especially in the battery tests where it easily beat the Lenovo ThinkPad X300 and the Sony TZ series (earning it a “Recommended” rating). 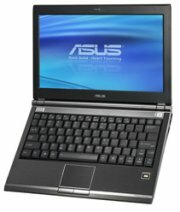 This entry was posted in ASUS, Reviews, Solid State Drives. Bookmark the permalink.